Synthetic Jeeps-Here’s a jeep you simply blow up like you do a tire. It doesn’t go anywhere of course, but it is designed to deceive at distances up to 500 feet. 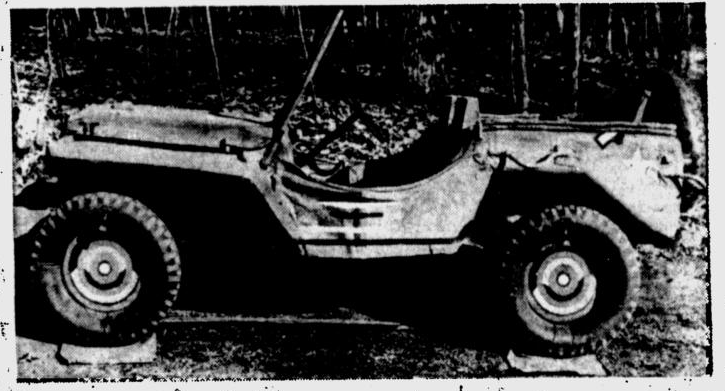 Pneumatic jeep, high fidelity model, is one of many used as decoys during war. Tanks and guns were also mode of rubber for purposes of subterfuge (Signal Corps Photo from Acme) St Petersburg Times – 21 Dec 1945.